Adorable Little Kyleigh | 5 Days New! Meet Kyleigh at just 5 days new! What a sleepy little sweetheart she is. Congrats to Katie and Johnny on an adorable little girl! Nikki & Ryan Are Engaged! 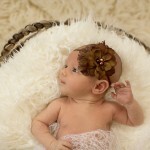 Sweet Savannah | 11 Days New! Sweet little Savannah came to visit me when she was just 11 days old. What a sweet little lady she is. Congratulations to Amy and Todd on their adorable little Savannah! © 2019 Gayle Driver Photography|ProPhoto Blog Template by NetRivet, Inc.